Home / Chloramines / WHAT FILTER SHOULD I GET? The answer depends on your situation. 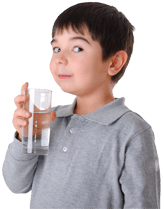 If you are on municipal water, then there really are only two questions you need to get answered to be able to select the best water filter. 1. Is your water fluoridated, read Risks of Fluoride Water? 2. We know there is chlorine in your water. Do they also add ammonia changing the chlorine to chloramines? The other issues – if you have municipal water – are nearly always addressed by all our kitchen canister filters. Exceptions would be if there is an unusual amount of nitrates or arsenic in your water. Each of these filters below is available in undercounter or countertop. We have put links in to the undercounter version. Just look in that section of the online store to see the countertop version. More (of the right) filter material means more filtration.